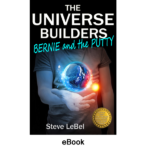 I just commissioned a developer to create a book trailer for Bernie and the Putty. I reviewed some of the work she’s done for other authors, and I am impressed. She said she should have something by the end of the month. I am looking forward to seeing what she comes up with. I am delighted with the book trailer. There are a couple things I want to change, but I couldn’t wait to put it on the website.